PLAINVILLE - Maggie Fallon and Robert Polselli have a way of completing each other’s sentences. It’s not in a way of interruption, rather than a seamless continuation of a thought that the other may have temporarily lost. 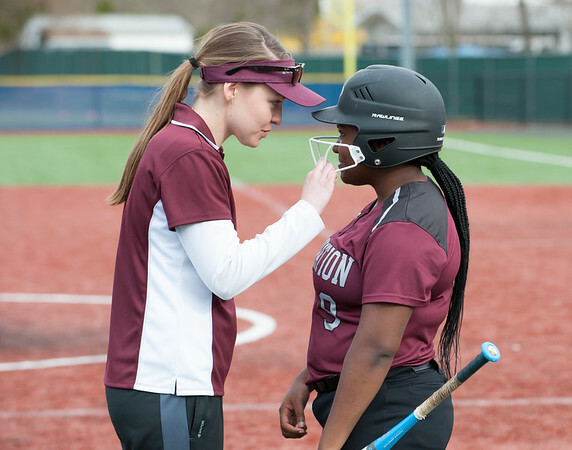 As the two Innovation softball coaches recapped the Ravens’ 13-8 loss to Plainville in their season opener, the duo’s ability to volley thoughts back and forth was on full display. “…and came right back and got three more,” Fallon continued as Polselli nodded in agreement, as if to acknowledge Fallon’s remark to be exactly what he was preparing to say. “Then we let them get back a few more, but we still kept fighting.” Fallon finished. The exchange is hardly uncommon for a pair of coaches that have been sharing a dugout for four years at Innovation. For Fallon and Polselli, such a verbal back-and-forth would likely be unnecessary if there wasn’t a third party involved. When the two are exchanging ideas and strategies, words are rarely required. Fallon and Polselli’s effortless relationship made the Ravens’ recent coaching change as easy as figuring out what the other one is thinking. Fallon, who was Polselli’s assistant last season when Innovation went 15-6 and reached the Class S state tournament, is now the head coach. Polselli has taken over assistant duties, leaving the Ravens’ dugout full of familiar faces. The coaching change has brought no alteration to the atmosphere around Innovation, which is appreciated by the rest of the Ravens, who come to bat at see the same two faces coaching first and third base, giving them guidance in between pitches. Fallon and Polselli’s coaching relationship also began four years ago, when Orejuela arrived at Innovation. It didn’t take long to realize the relationship would be a successful one. Fallon’s experience working with Polselli, along with her experience around the team, has helped make her transition to head coach as easy as possible, helping her eschew some of the normal adjustments that often come with the territory of first-year head coaches. Both Fallon and Polselli took equal time to address the team after the loss to share their thoughts and encouragement on what they felt was a promising opening game to the new season. For the players, the postgame meeting could have taken place last year and nobody would have been able to tell the difference. Aside from labels next to their names, things haven’t really changed for Fallon and Polselli. They’ll both be in the dugout for Innovation this year, guiding the team through what they hope will be another winning season. Should either lose their train of thought when offering instruction, the other will still be there to pick up the other’s sentence and keep the smooth train ride rolling towards another state tournament appearance. Posted in New Britain Herald, Innovation on Wednesday, 10 April 2019 21:09. Updated: Wednesday, 10 April 2019 21:12.